Hope you can join Nativity Italian Heritage and Cultural Society for a delicious culinary evening , when Chef Benny Genuardi of Villa Bella, Burke, conducts a cooking demonstration and offers a sampling of Italian specialties. 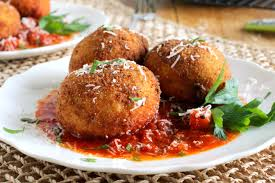 Attendees will learn about regional cuisine and partake of a tasting of Caponata Siciliana and Arancini which are pictured below. Wine and desert will also be provided at the Demo. Reservations are required as this wonderful program will fill up fast. If you previously signed up at February’s meeting, it’s not necessary to resend your request unless you are unsure of attending. Please provide your name with number of guests to hospitalitynihcs@gmail.com no later than Tuesday, April 16th.If you are interested in becoming a member of the Nativity Italian Heritage & Cultural Society (NIHCS) click on the Membership button below. A wonderfully delicious appetizer of eggplant, capers, celery, carrots, fresh basil and mixed olives in a tomato sauce reduction served with crostini bread. Risotto balls stuffed with meat sauce,fresh mozzarella and peas, coated in a bread crumbs and flash fried in a golden brown served with a side of marinara sauce.